Model T Ford Forum: How many use an air filter? How many use an air filter? 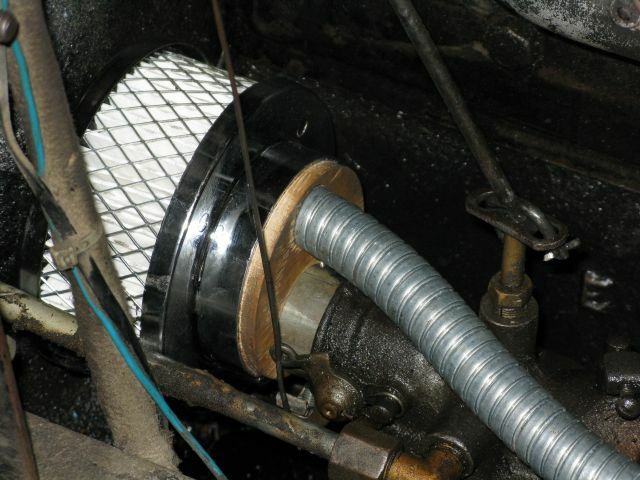 Model T Ford Forum: Forum 2012: How many use an air filter? I use a filter off a motor cycle. The foam type oiled,works well. when you clean it you appreciate having it on with all the dirt you wash out knowing it has not become a on the move rebore. My stock T's see a bit of dirt road but not regularly so I don't tun a filter. My speedster sees dirt on most endurance runs and occasionally when just out driving, it has an air filter. Hey Peter, that is what I use, when you see the dirt that did not go into the engine it make you feel like the filter was a good idea. Having the carburetor right behind the front wheel has got to pull a lot of extra road dust to the intake. Ralph I was wondering about your posts with all of the periods in them. The parrot story explains that. I thought you had one of those fancy texting phones going for you! What did you use? Motorcycle, lawn tractor ?? 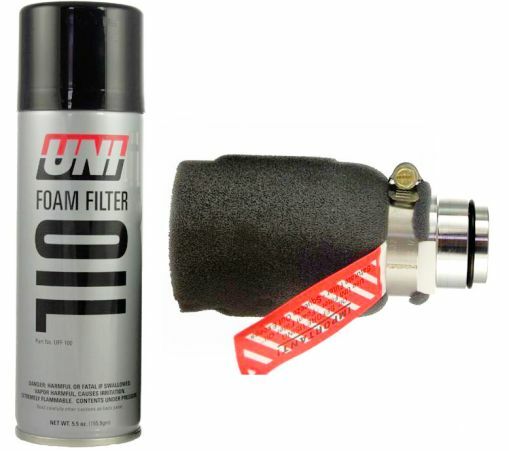 More importantly if your filter works well for you...exactly which motorcycle or lawn tractor filter did you use? I have not been able to find anything off the shelf that will fit well. I bought one of these foam filters from Lang's a couple of years ago�Trish might have sold it to me (sound of angels singing in background). The filter is ridiculously easy to install. At the beginning of the driving season, I pull it off the carburetor, give it a spritz from the spray can of filter oil that came with the kit, pop it back on the carb and forget about it for another year. I bought one of those too, and I mad another from a motorcycle filter and a couple of bits of PVC tubing with an O ring, works just as good for a fraction of the cost. I use an air filter, except during the MT500. The current rules don't allow them. I made one for my vaporizer. Foam filter media with oil spray. Would not run without one. I use the one posted by Bob above and it works great. I run a vaporizer. It breathes from vents under the throttle as well as through the air horn... so a foam filter on the horn should change the airflow dynamics... I'm not sure how that would effect the low and "high" speed running. I'm sure dirt contaminates still get in through the vents, but probably just a fraction of what I get running with the horn open. Gary, how about a review of your carb performance with and without the filter? 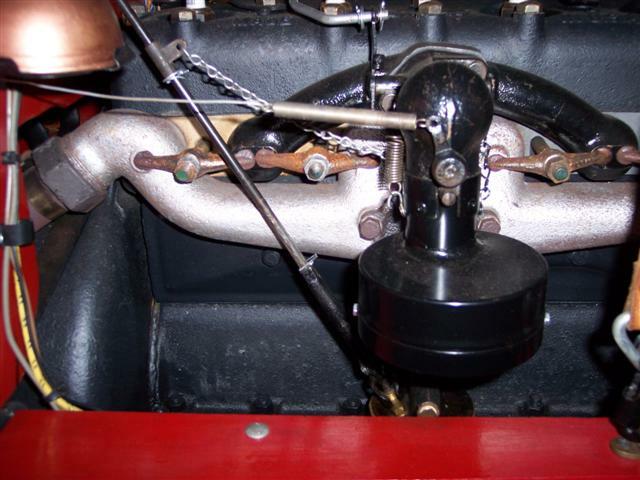 On a different topic, I installed an original throttle linkage rod onto my '27 Holley vaporizer yesterday. The throttle feels much different with the tighter fitting and stiffer rod in there, just a little better response to the control... a property not critical to the T's overall performance. I run a 4" diameter X 2 paper element filter similar to the one Terry shows above. I surely wouldn't want all the dirt that it collects to go thru my engine. I don't even go on any dirt roads. I get them at the local auto parts store. I run one of the filters on my 24 T like Bob Coiro showed. I am almost certain it restricts the carb. as I seem to lose power when I install it. It is a must however for my dirty KS environment. I got a foam aftermarket motorcycle unit for a large capacity dirt bike. 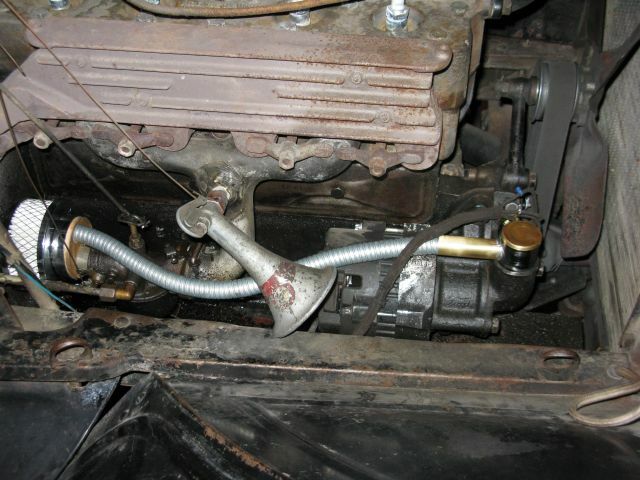 Adapted it with a piece of top radiator hose from a '74 302 Fairlane to move it away from the hot exhaust. Works well, clean it once a year. Terry, I haven't run a comparison with/without air filter and T is put away till spring so I can't provide any info on it's detrimental affects, if any. The bottom of the can is open so air flow is the same upward flow. I figure the primary air inlets are quite small compared to secondary (main) inlet so I don't worry that much about the small amount of air entering there. Dang, I must REALLY be in the minority here. I do not use an air filter on either of our T's or our A. Partly because of my purist nature. Partly because of the feeling the T is anemic to start with and needs all the air it can get. And partly because I've heard of a flooded engine saturating the air filter with gas and becoming a fire hazard. That last one may be more hype than truth, but I have to say it does come to mind when I see a filter on T's and A's. I never ran one on my coupe, though I see the merits. I always seemed to need the hot air pipe, to keep from freezing up in the cool damp air here. I probably won't run one on my TT either. "And partly because I've heard of a flooded engine saturating the air filter with gas and becoming a fire hazard. That last one may be more hype than truth, but I have to say it does come to mind when I see a filter on T's and A's." Strictly hype, Hal. without an air filter or screen to break up a backfire, you can get a torched engine, or worse. BTDT. The white is from the extinguisher that save the car. What part number or id, Gene? Nice to have a full keyboard again, huh Ralph? It goes to the oil filler. PCV sorry I can't find my photo. My question is about Gary's photo of the vaporizer. My question is about the carb itself. 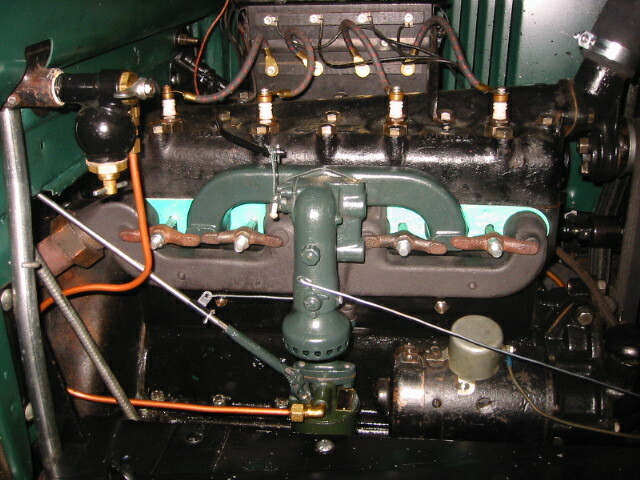 In the back there is the throtle rod. Then the chain you have for the choke. What was the one in front for and what was it hooked up to? Mines just sitting there hooked up to nothing. 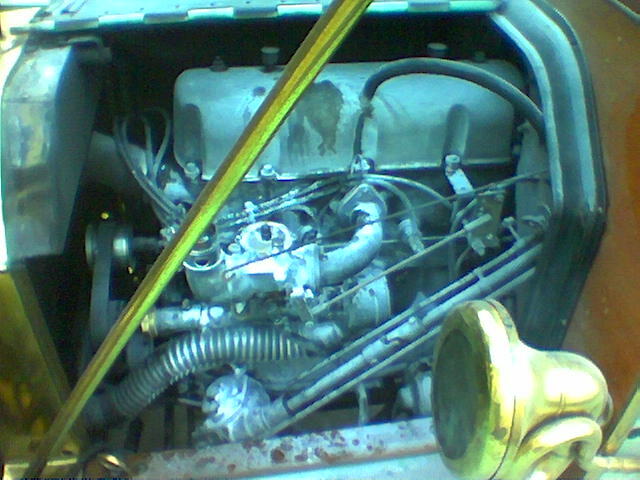 I found this picture of a 26 engine and it hooks up to a rod through the radiator. Was this stock? I installed the foam filter from Lang's soon after I acquired the car, but without the heat pipe, carburetor ice developed on a cool, damp day so I removed the filter and re-installed Henry's heat pipe. Maybe if I ever drive it in summer on dirt roads I will use the filter at that time. Be careful of using a paper filter attached directly to the carburetor intake. That area can get pretty dirty and oily. The end result is a poor performing engine that is hard to diagnose, until you take the filter off. Experience is speaking. I use the foam filters with good results. The only down side to an air filter is leaving it on after it gets dirty and therefore affects performance. Actually the fact that it does get dirty is a plus too. Randy, The one in the front is just a return spring connected to the dash with a length of wire. That's where the choke wire to the front would connect for hand cranking. Which I don't do. The chain gives a little free play in the choke hook up. No real advantage I suppose but kinda like it. A piece of wire of the proper length is normal. Other type of filter to consider, the Model A type wire mesh type. 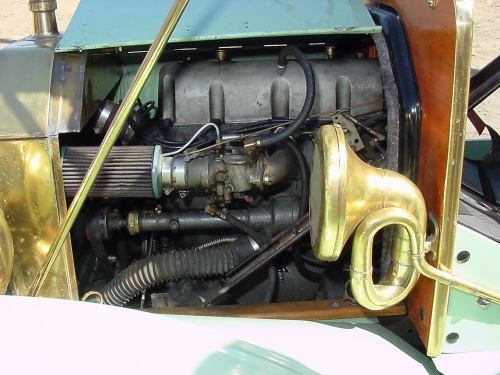 Model A's have the same problem with air/fuel mixture if you use a paper type element and don't keep it clean. The wire mesh type is just layers of mesh, like loose steel wool that you keep oiled to trap the dirt. Any gas will just drip out when you prime to start. I noticed on Randy's picture there appears to be an air scoop of some kind on the primary air inlet. Any one seen this before? Some vaporizers had the "air scoop" and others did not! If it had a scoop there was a hole in the vaporizer casting to allow a screw to hold it on. Ones that did not have the scoop did not have a hole for the screw in the vaporizer casting. Thanks Arnie. I wonder what was the reason for the scoop? Also, are the manifold clamps on upside down or a later design? Never mind. Found the March 20 post on manifold clamps. Here's the Air Filter that I have been using for a few years now. I get the replacements at the local AutoZone. It's marketed by SPECTRE and has a part number of 4809 for the filter element and 4790 for the complete kit with the cover plates. Cost was 7.00 for element and 12.00 complete kit. I haven't done any real testing to determine if it restricts any air but with my top speed of 68mph a little restriction there may be Good? It's amazing how much dirt it prevents from being sucked into the engine. So let me ask this. Do you think the engine pans helped serve this purpose? "Fits carburetors with 2-5/8'' or 2-5/16" necks", which is obviously not any T carb. So how did you adapt it? As Joseph said ... pictures would be most helpful! Sorry Bud and Joe no pics but for a mounting. I used the "kitchen sink" Well sort of. 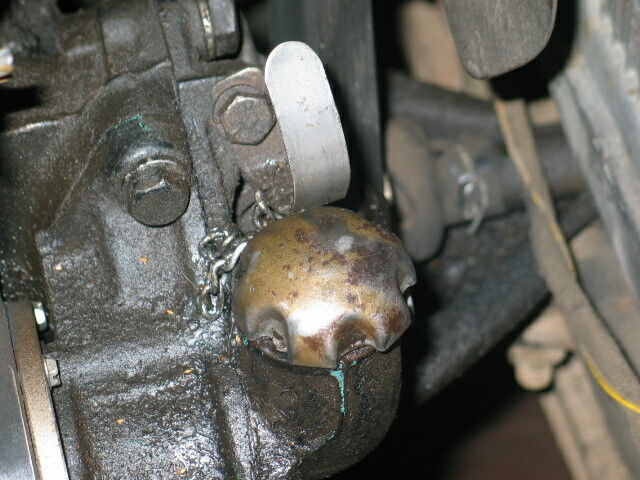 I run a Stromberg OF and found that the s/s stopper had the right size ID to fit. After cutting off the top I welded the back to the plate that is provided in the kit. Works fine for me. Good Hint for those that don't run the engine pans is to attach a tye wrap to the filter just in case it falls off to prevent it being lost on the road. No pans. Loss preventer for oil cap. Hey Gary,. Ralph Ricks told me his secret about gluing a small magnet to the inside of the filler cap After I lost a nice orginal from my '12. Worked perfectly ever since and isn't like an unsightly chain thing. It fits right in. To some I have quite a few unsightly things on my speedster. Anyway, not all that noticeable and no one has walked off with it. Dean, I'm wondering if your runnning the same filter that I am? Is your element a 4" X 2" part # 4809 from Spectra? I pick mine up at Auto Zone or the other parts stores. Last filter was 6 bucks. I've often wondered if enough air flows thru it but top speed was over 60. Dean, I'm wondering if your running the same filter that I am? 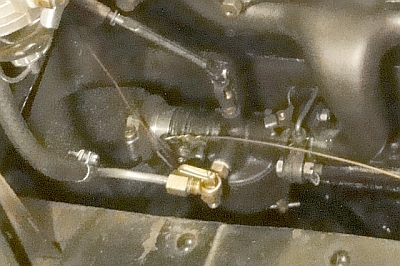 The wire leading to the front of the car from the choke was an official Ford feature, but it was added by the dealer on request and not the factory. It lets you choke while starting form the hand-crank. 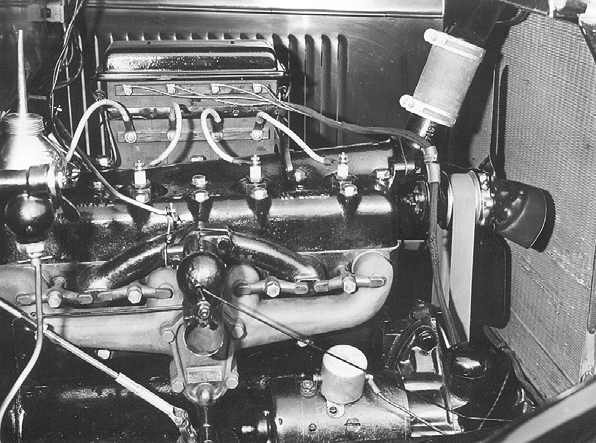 The starter-equipped car had the extra lever on the carburetor and the hole in the radiator apron, but not the wire unless you asked for it. 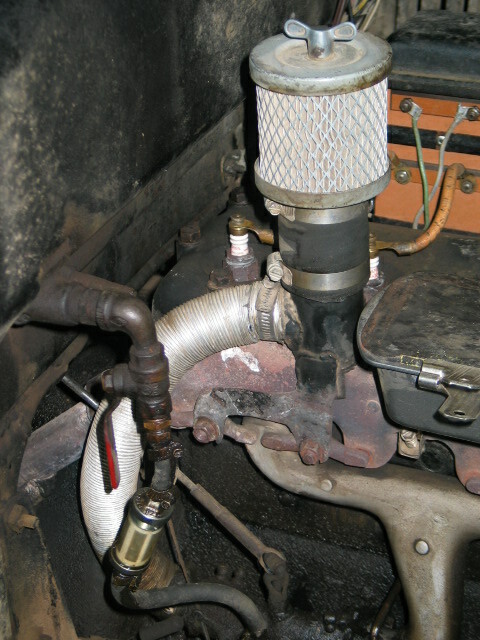 The only air filter installed at the factory was the one on the intake of the Kingston B-1 Gassifier, as shown in the photo. Near as I can tell, it keeps small gravel out of the intake structure. 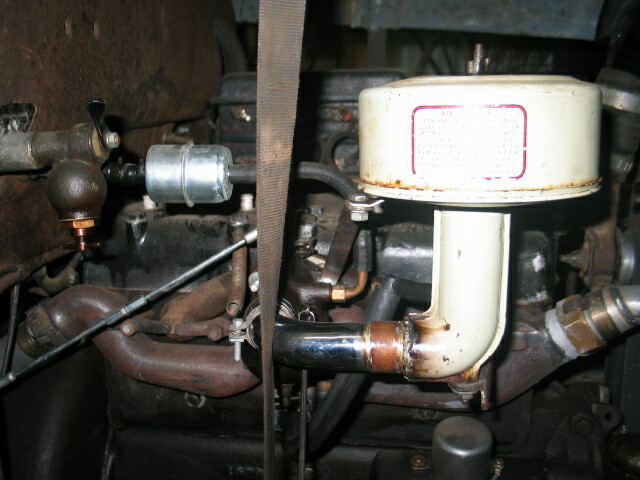 In the patent description for this carburetor the door-knob shaped thing attached to the intake is identified as an air filter, and not as a flame arrestor as some have claimed. I'm considering loading it with oil-soaked steel wool. The one air filter is attached to the exhaust manifold to it has a preheat to it and it works great I have run it without a problem for a number of years. The other is on a side draft carb and I just built it,I am taking it to speed week on the salt flats next year and wanted a filter on it. 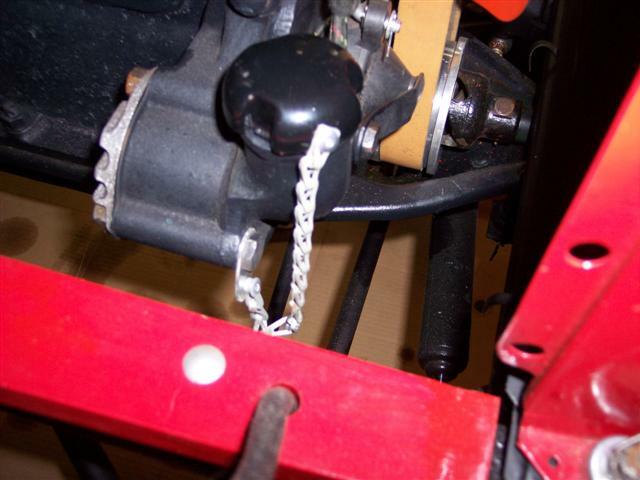 I had a problem with losing my oil cap so I put it on a chain and made a spring to hold it on out of a piece of band saw blade with the teeth ground off and haven't had a problem since.